The Dillon Ranger District district announced Monday morning, Oct. 10, that the Frey Gulch Fire in Dillon was 100-percent contained on Sunday evening. The federal investigation into the cause and potential charges stemming from the 22-acre wildfire is ongoing. 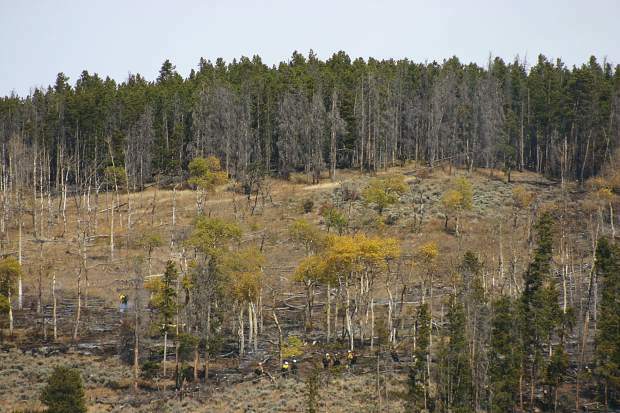 The 22-acre wildfire at Frey Gulch in Dillon is now 100-percent contained. Fire officials from the Upper Colorado River Interagency Fire Management Unit declared the fire under control on Sunday, Oct. 9. A 20-person hand crew and a fire engine were relieved Sunday night and remaining crews are expected to demobilize as necessary today or tomorrow. A helicopter will remain on standby to provide additional water drops if needed. Bryson Jones, 31, of Denver, was at the Summit County Shooting Range in Dillon on Saturday afternoon, Oct. 8, during the time of the incident and took responsibility for the fire. According to officials, Jones was reportedly firing flammable rounds, which are not authorized at the shooting range, and that likely caused the fire. The Summit County Sheriff’s Office cited him for fourth-degree arson of property valued under $100, and released. The federal investigation is ongoing, however. Jackson noted that “if the evidence and probable cause line up,” Jones could face a range of additional charges depending on the evidence. The Dillon District’s law enforcement officer, Jill Wick, is conducting the probe. In the meantime, access to the Summit County landfill is again open via Landfill Road. The Summit County Shooting Range will remain closed to accommodate the ongoing fire suppression operations. Public and firefighter safety continues to be a top priority. The Oro Grande Trail and Tenderfoot Mountain Trails remain open (Tenderfoot Mountain single-track trails will be under seasonal closures to motorcycles beginning today, Monday, Oct. 10), but recreators and hunters are advised to exercise caution, stay away from the Frey Gulch Fire area and let firefighters complete their work. For more information, please call the Dillon District Ranger office at (970) 468-5400.